It has been more than six months since I last ate at Nam Seng (南生) Noodles and Fried Rice. Located at China Square, the place was well-received by many professional, locals and foreigners. The last time I had was the Venison Hor Fun which was delicious. This time, I decided to try the Fried Rice, one of their five items in the menu, as I was famished. 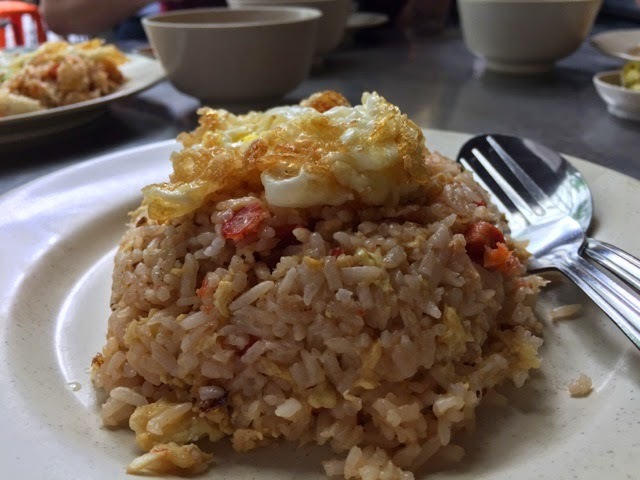 At SGD4, you will have a plate of fried rice topped with fried egg. The rice was cooked with Char Siew Meat (BBQ meat) and scrambled egg. You may even order a larger serving at $5. Prepared in advance, the server scooped the rice from a food warmer/ rice cooker. The dish was at normal temperature when served and I finished the rice within minutes. I was dissatisfied. I felt that I was half engine full and had to go for a second round elsewhere. I can only say that the fried rice is normal. It will be some time before I come back again for lunch.